This year I planted my first little garden and I’m happy to say, it has flourished. The wee little basil plant is now nearly unruly and I’m convinced that every time I snip some off, it grows back threefold! If I didn’t know any better, I’d say it was a weed. Nevertheless, I’m on the lookout for ways to use it all up so when I happened upon this recipe, I knew it was a good place to start. This makes for a light, full of flavor, dinner choice. 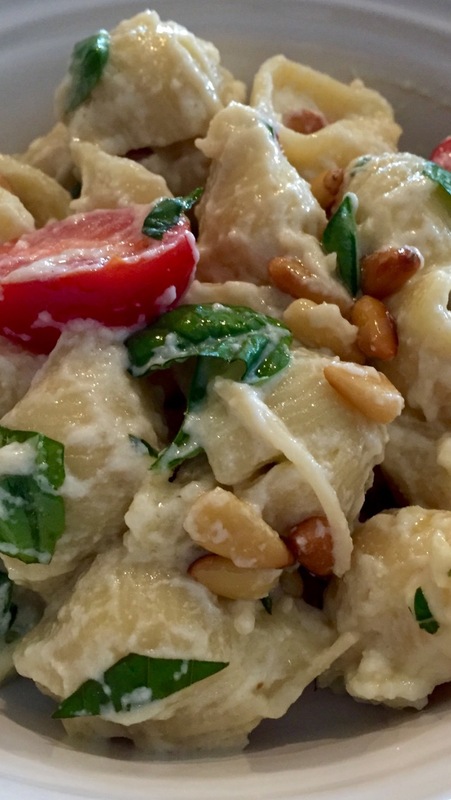 In a large bowl, combine the pasta shells with the ricotta, garlic and olive oil. Stir until the ricotta lightly coats the pasta. This entry was posted in Italian, Pasta, Vegetarian. Bookmark the permalink.